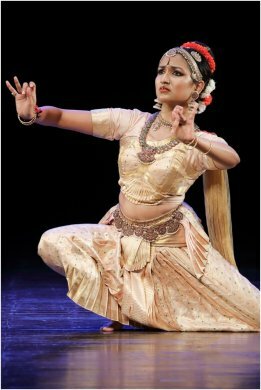 You are a daughter and disciple of celebrated exponents of Kuchipudi, Raja-Radha Reddy. Is it a matter of unmixed pleasure? Or, you feel pressure on you to come up to the expectations of such legendary gurus?! For me dance is a way of life. It came as naturally to me as eating and drinking and sleeping. I saw it all around me and I didn’t know life another way and also as a kid it was fun! I was a very social person, so I wanted to go to dance class and meet all my friends and be in it together. As children, my sister and I always learned in group classes until adulthood when I started doing my own practices. My competitiveness kept me attentive and I always liked being good at whatever I did. So I would say this has been an unmixed pleasure and I am thankful to my mothers for making this a fun-filled exciting activity in my growing years. Living up to my parents’ names has never been a pressure for me. I continue to seek to be my own person always. You are perhaps amongst the youngest to have received the award. There is a decade left yet for you to remain qualified to receive it. What’s the secret of your accomplishment at such a young age? I think things happen when you least expect them. Keep working with your art day in and day out for the pure passion of it and a clear path will appear in front of you. Everything and more will fall in place. Eyes on the dance and not on the prize! You have a talent for music as well. Does it complement your dancing skills? Definitely, I understand rhythms very well. I have had Carnatic music training for almost as long as my dance training followed by an intensive course in western music and its theory at Musicians Institute, Hollywood, California. The former helps understand the usage of sahitya and the way it is emoted with the gamakhas and nuances while the latter has also helped with translating rhythms and expressions. 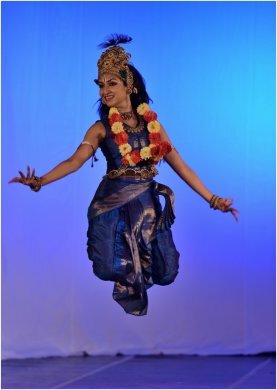 There are subtleties that westerners use in their abhinaya that are choreographed to western music and it is very easy for me to understand them. Command over rhythms makes it very easy to improvise and change things both with expressions and rhythms. It always helps me live and relive the dance pieces in every new show. You brilliantly played Shandilya in the dance drama Bhagavadajjukiyam. Have you been trained in dramatics? I have not been. In fact, I wonder if that’s something I should do to augment the already inherent aspects in Kuchipudi dance. I really enjoy Shandilya and reliving emotions of sorrow, anger, irritation, and romance through a comical perspective. It’s a new experience and has shown me that finding humour in things in life helps get through them more easily. I notice a dash of playfulness in you as a young person. How do you focus on your continuing sadhana and manage to have the right composure when you perform? I believe that life is not to be taken too seriously and I’m working on living by just that seriousness. Till you master a technique, a routine is very important but after that one has to take oneself less seriously and be that someone else (character) that they are to be. Mastering the technique first is very important and is the essence of classical dance. 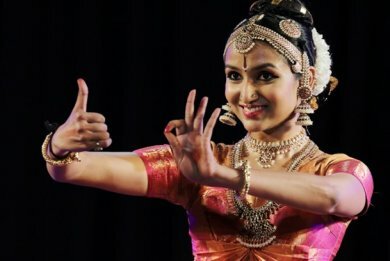 At the Kennedy Centre for Performing arts, you splendidly rose to the challenge of making Kuchipudi intelligible abroad. How did you prepare for it? I practiced like I always do 4-5 hours every day. I introduced to my practice Hatha Yoga and Pilates that worked wonders. It helped me do the same routines with ease after a matter of only two days of combined practice. But the experiment at this time was completely coincidental and had no relation to my prep for the Kennedy Center. The major prep that I did exclusively for this show was to maintain composure and take it as just another show. I prepared myself to conquer the stage and the show and not let the prestigious title of the auditorium and its history conquer me. You did a dance piece on an English poem set to western tunes at the Kennedy Centre. How was the experience like? Did you feel limitations imposed on your expression? The experience was great. I was following completely different rhythms from what are played by drums in a song. We follow completely different patterns and coming together at the end of each section. So it’s a challenge because the combination of rhythms and rests (silence) is recited in my head and my head alone. My ghungrus recite it for the audience, so I am the rhythm! Expression-wise it is like playing quite another character - a westerner, whose expressions are subtle, and a bhakt who is intrigued and elated, accepting all at once. As you know dramatics in the West is very different from Indian dramatics. I tried to emulate subtleties to the best of my understanding. A performing artist needs to keep growing. What do you regularly do to keep enriching your artistic sensibility? I am reading a lot these days about the theory of dance from various perspectives. I am excited to see how that would change my practice. Meanwhile, I am also looking into cross training to improve dancing and a dancer’s health, longevity, nutrition etc. You have acknowledged you have three gurus at Tarangini Institute. Who among the three specializes in choreography? It’s hard to say. Raja Reddy, my father, specializes in choreography. Radha Reddy specializes in improvisation and she can change it at any time. Kaushalya Reddy gives definition to the presentation. Each has a role in a new dance piece. When you are part of a group production, do you feel you get the space for creative inputs? Not always. Depends on whether I am performing a strictly set rhythmic pattern in a group or whether I have a solo role to play - or even if I have abhinaya to do where I can give my own flavour. Have you tried your hand at choreography? I have choreographed to my own songs, but that’s a world that I think I am yet to explore. What do you see beckoning to you at the far horizon? Kuchipudi to be a viewing pleasure to all across the world, and for it to be as popular as a ballet.